What’s in a Pattern’s Name? Home » What’s in a Pattern’s Name? C. Dorflinger & Sons defined a few of its motifs and patterns differently than those of other companies. This has led to some confusion to collectors and misrepresentation in the marketplace. Although the terms in this file have been defined elsewhere in AMERICAN CUT GLASS, they are brought together here for convenience. DORFLINGER LINE DRAWINGS (ACGA, 1994) is the primary reference, supplemented by the DORFLINGER composite catalog (ACGA, 1997) and Feller’s book on DORFLINGER (1988). Hollow Diamond — Honeycomb: In Dorflinger’s catalogs one finds that the company used the term hollow diamonds to describe a motif/pattern that other companies called honeycomb or St. Louis Diamond. 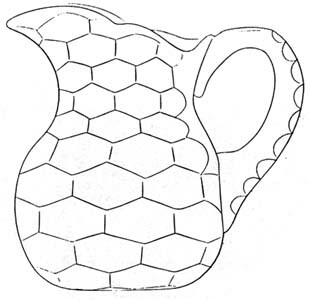 Dorflinger’s Honeycomb pattern, contrariwise, is unique and does not reflect the usual hexagonal cell-structure found on other companies’ patterns that have this name. Feller, unfortunately, often treats the two terms synonymously; but it should be noted that when does he is not quoting from the company’s catalogs. It is possible, therefore, that the Hollow Diamond pattern (if not the motif also) was called “Honeycomb” at the Dorflinger company on occasion, but those occasions were almost certainly informal ones. Note also that while the Hollow Diamond pattern contains hollow hexagons in Dorflinger’s definition, other companies applied the name to both hollow hexagons and hollow diamonds. 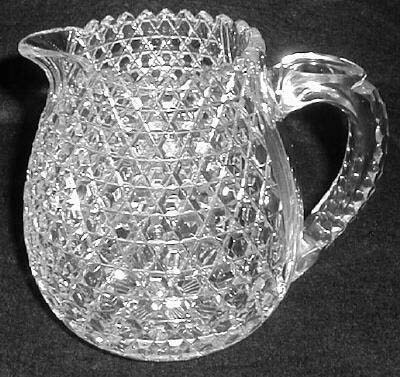 The Dorflinger company may have used the motif’s name to describe hollow diamonds — such as those often found on the necks of decanters and carafes — but there is no record of this because patterns are not described in catalogs in terms of their motifs. For the so-called honeycomb pattern, Dorflinger used the name Hollow Diamond exclusively. Heavy Flute — Colonial: Although Feller indicates that the Heavy Flute pattern was “misnamed ‘Colonial'” (Feller 1988, p. 66) in the past, details are not given. Today’s collectors, unfortunately, sometimes use the two pattern names interchangeably, perhaps because Heavy Flute is identical to Hawkes’ Colonial pattern. Dorflinger’s catalogs, however, clearly differentiate between Heavy Flute and Colonial. The latter pattern was patented by James S. O’Connor in 1893. The Heavy Flute pattern — sometimes called “Broad Flute” when the manufacturer is unknown — is also occasionally referred to as “Prince of Wales” because the Canadian Pacific Railroad chose it for the tableware that was used on the Prince of Wales (later Edward VIII)’s tour of Canada in 1919. The Heavy Flute pattern was introduced sometime before 1905. Hob Diamond — Hobnail: Hob is a shortened name for hobnail. Dorflinger always used the pattern name Hob Diamond while most of the company’s contemporaries simply used the long version of hob — hobnail — and dropped the word diamond as unnecessary. Note, however, that diamond is not used in the geometric sense — as an equilateral quadrilateral shape — in Dorflinger’s motif/pattern, but, rather, as a way to draw attention to the glass metal’s similarity to the “colorless . . . precious stone of great brilliance” (NEW SHORTER OED) that is a diamond. Hob Diamond & Lace — Cane: In the Hob Diamond & Lace motif/pattern Dorflinger simply combined a double X cutting, lace, with the hob diamond. In contrast to the foregoing entry, the hob diamond here is octagonal rather than hexagonal. The generic name for this motif/pattern is cane. An error is found in the DORFLINGER LINE DRAWINGS publication. The only example of the pattern in this publication is given as drawing [no.] 104, a square vase, on p. 76. Unfortunately, when the drawing was made the draftsman overlooked the small diamond symbol that always follows the word Hob in Dorflinger catalogs. As a result the illustrated pattern is incorrectly labeled Hob & Lace instead of Hob & Lace Diamond. This error also appears in Feller (1988, p. 264), but Feller realized that this is an error, and he indexed the pattern correctly. The compilers of LINE DRAWINGS, however, did not recognize this error and, as a result, the pattern is incorrectly listed in that publication’s Index of Patterns. Silver Diamond — Strawberry (Fine) Diamond: Two Dorflinger patterns contains the term “silver diamond”: Mitre and Silver Diamond, and Strawberry Diamond and Silver Diamond. In addition, silver diamond is sometimes used by collectors to describe the motif that is more generally, and accurately, known as strawberry (or fine) diamonds. The so-called silver-diamond motif has a silvery look that is produced by a “low” polish. But whether such a motif actually looks silvery or not is a judgement call. Because of this, and because silver diamond is a proprietary term, strawberry (fine) diamonds is the preferred term to use, even when the motif is present on a piece of Dorflinger glass. In other words clarity is gained, and ambiguity eliminated, if, for example, one lists the motifs in Dorflinger’s Mitre and Silver Diamond, and Strawberry Diamond and Silver Diamond patterns as: miters, strawberry (fine) diamonds, and cross-cut diamonds. When the strawberry (fine) diamond motif is cut by other companies, there is even more reason not to use the term silver diamonds. The pitcher in this file was chosen for discussion mainly because of its images: Side, front, and rear views are all available, and there is also a close-up of the cutting which is particularly effective in showing the thickness of the pitcher’s green overlay (casing). It is assumed, with a high degree of confidence, that the pitcher was made by C. Dorflinger & Sons because both pattern and blank (shape) can be found, separately, in the company’s catalogs. Note, however, that “By the 1890s . . . Dorflinger supplied blanks to more than fifty cutting shops in Wayne Country [PA] alone, not to mention many other cutting shops in other parts of the country . . .” (Barbe and Reed 2003, p. 71). One of these shops could, of course, have cut this pattern on a blank supplied by Dorflinger, but the writer believes that this is a remote possibility. This file is also used to provide an overview of the several different names that have been used by various manufacturers for this common nineteenth century pattern which Dorflinger called Hob Diamond & Lace. The blank (shape) is the company’s “No. 1 886 jug”. Note that Dorflinger sometimes used identical numbers for different objects; for example, the number 886 was also used for both a shorter version of this pitcher and a decanter. No dimensions are available, but the pitcher is probably about 12″ tall. It is not in mint condition. There is a crack — described by the seller as “a fine line … an inch and half long .. only seen when held up to daylight from the inside, it is not visible from the outside”. According to the seller the pitcher was once owned by Robert Clothier, a past-president of Rutgers University (elected in December 1931). 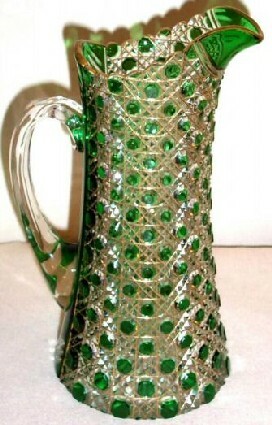 The pitcher sold for $535 at an eBay auction in 2004 (Images: Internet). As mentioned, the official Dorflinger name for the pattern in this file is Hob Diamond & Lace, where hob is the equivalent of, and not an abbreviation for, hobnail. The name emphasizes the two elements found in this motif/pattern: the hobnail diamond and the double-crossed X, here called lace. Dorflinger and Hawkes apparently were the only companies that used the word “lace” in this context. Hawkes called the pattern Lace Hobnail. The Boston & Sandwich, Mt. Washington, and L. Straus & Sons companies called the pattern Octagon Diamond, as did J. Hoare & Company where it was usually listed as Oct. Diamond. Unlike hob, oct. is an abbreviation — for octagon, not octagonal. Hoare apparently called the pattern Chair Bot[tom] Hobnail originally. Today, chair bottom is occasionally used as a generic name, but it is also sometimes incorrectly applied to the generic Harvard pattern, which is a different, but similar, pattern. This variety of names has caused collectors a degree of confusion and also a problem: When the actual maker of an item in this pattern can not be identified, what name should be used? Clearly, it is inappropriate to use a particular company’s name for the pattern because such a name is proprietary. The answer to the question — and one that has been followed since at least 1950 — is to use the generic term cane, a reference to the woven chair seat (“bottom”) which the pattern resembles (note 1). 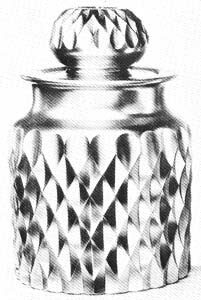 Glass cutters in the U. K., where the cane motif/pattern was particularly popular during the late nineteenth and early twentieth centuries, tended to use the name alternate panels, although some (Wilkinson 1968, p. 36) incorrectly, and confusingly, called the cutting hobnail (Newman 1977, p. 22). At the Val St. Lambert factory in Belgium the pattern was given the name gros diamants à 8 pans. Brief mention must also be made of the related motif/pattern called hobnail. Hoare, Hawkes, and Straus all used this single word for their patterns. And the name can also be used generically. Dorflinger chose the relevant part of the name Hob Diamond & Lace, that is, Hob Diamond, but note that this applies to a hexagonal hobnail, not to the octagonal hobnail of the Hob Diamond & Lace pattern. Mt. Washington also faced this situation. 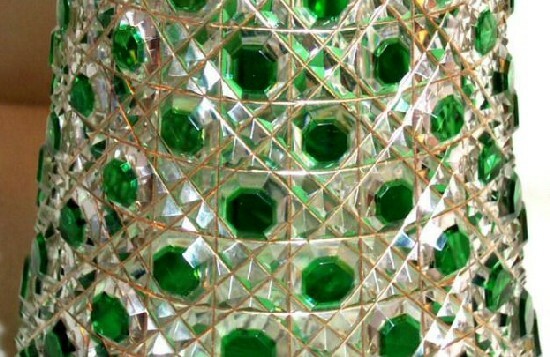 It named its hobnail pattern Hexagon Diamond in order to distinguish it from the company’s Octagon Diamond pattern. The hobnail pattern has hexagonal hobnails that are formed by three intersecting sets of parallel miter cuts. Standard (i.e., double-mitered) cane has octagonal hobnails that are formed by four intersecting sets of parallel miter cuts. We can now turn to the errors mentioned at the beginning of this section. (i) A proprietary name, Dorflinger’s Hob Diamond, has been applied to a pattern cut by a company other than C. Dorflinger & Sons. and listed in the catalog’s article index. But most people will turn to the pattern index to search for examples of Hob Diamond & Lace, and they will find none! by replacing Val’s pattern name with a proprietary, American one — Dorflinger’s Hob Diamond — which is, as we have seen, doubly incorrect. A pattern’s original name must always be given priority. To do less is demeaning to the company represented. This is especially egregious when the company is a foreign one. The writer realizes that this introduces a problem: How should American collectors use foreign-language names of patterns and motifs: in their original languages? in translations? or both? This problem is minor today but will become more important in the future when foreign influences on American cut glass, and vice versa, are explored to a greater extent than they are today.